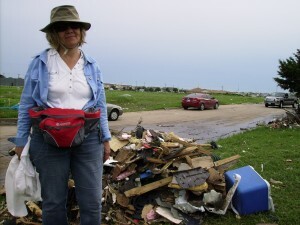 I witnessed last Monday’s tornado in Moore, Oklahoma, from a safe distance – my mother-in-law’s apartment in Colorado Springs. We watched it happening live on the weather channel. Yesterday I went to volunteer in Moore with a church disaster team. 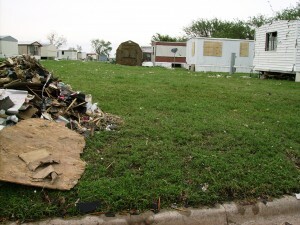 They didn’t send us to the area hardest hit, but to a trailer park in a peripheral area. The EF-5 twister was on the ground for about 40 minutes and responsible for 24 deaths and more than 200 injuries. Thousands of homes were damaged or destroyed. The trailer park were I worked with other volunteers that afternoon hadn’t felt the full force of the tornado’s 200 mile-an-hour winds. 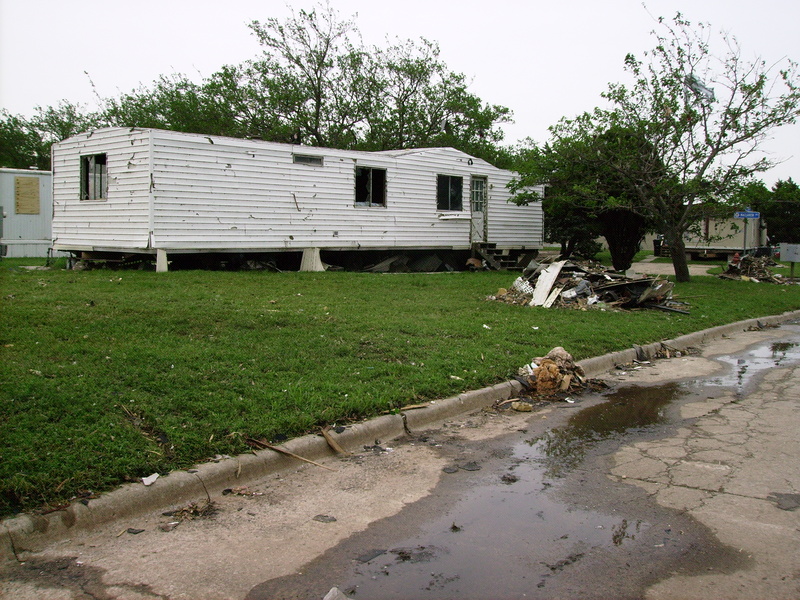 But it incurred enough damage to make the mobile homes uninhabitable. Windows were blown out and roofing and papers and pieces of people’s lives scattered everywhere. Earlier, on my way to the work site, I had to drive past houses in the tornado’s path. Big houses on foundations. They looked like someone put had put them into a huge blender and pushed the “on” button. I got lost, and in the bumper-to-bumper traffic pulled off the road to ask a man in a construction-type trailer for directions. The parking lot had been taken over by some big company that clears disaster areas. The man was from Texas, and didn’t know where he was, either. Utility trucks trying to restore power stuck out in traffic, narrowing the flow to one lane. National Guardsmen stood at side roads near barricades, keeping vehicles out. I called out to a guy getting back in his jeep. “Can I turn right at the next light?” I asked. He said he thought I could. And I crept along, inching my way toward where I hoped I would find my volunteer group. I showed him my directions, and said I was turning off at a work site to volunteer. On the grassy area between the trailers I found a page from someone’s yearbook, a program from a play in which the people had ’70s hair styles. And puzzle pieces and lots and lots of insulation and tar paper. The roofing I picked up looked like kindling, or shredded sticks. A square of board about eight or ten inches penetrated the ground as though someone had hurled it and it stuck there, one corner facing up. It took two of us to wedge it loose. At supper time, a local restaurant came around with boxed meals and drinks. One of the guys who hopped out of the car with the dinners told us how the previous night at sunset, the sky had glistened with glittery sparkles. Asbestos. I felt like I was in a toxic waste dump. Two volunteers eat meals delivered by a local restaurant. Where were the people who had lived there? Did they get out in time? They were all out of surgical masks when I got there, but I was lucky enough to have a piece of fabric in the back seat of my car – an old sheet I used to cover the back seat. I ripped it with my teeth to make a mouth and nose covering. When I took my white bandana off, a round, brown area indicated where my mouth had been. I cleared an area smaller than my living room. It was like putting a band-aid on a train wreck. I only hope that volunteers keep coming, next week, and next month, until they get it all cleaned up. We made a small dent. And I hope that the people of this state, and everywhere along “tornado alley,” demand a plan: public tornado shelters, safe rooms, and safe places for all their children at school and daycare centers when it happens again. Because it probably will. As soon as I got home I stripped out of my clothes. I threw everything in the washer and then took a hot shower. I can’t imagine what the victims are going through.